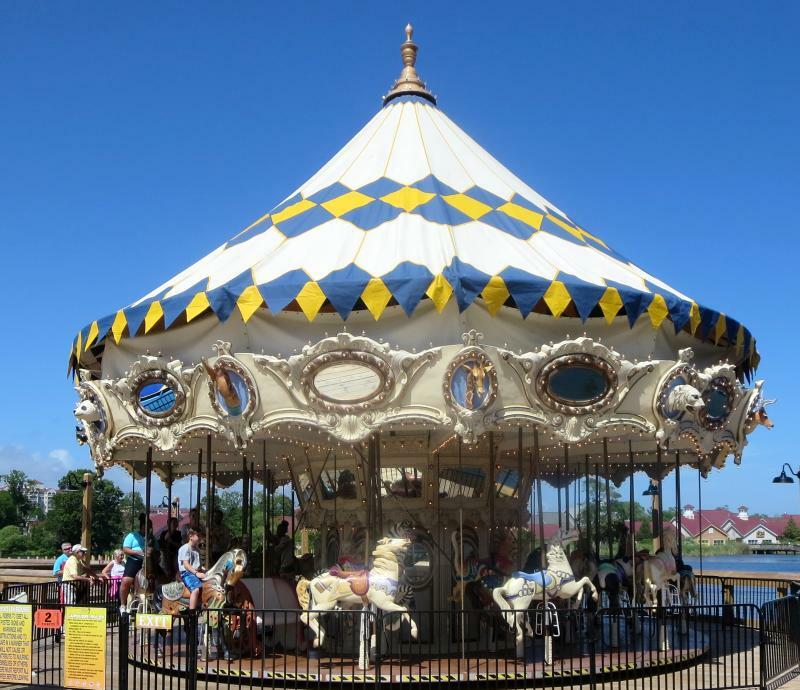 Barefoot Landing is not what it used to be. The shopping area was taken over by another company and the first thing they did was raise the rent 30%. That drove many of the cut price stores out of the Landing. The Izod store is gone as well as many of the other factory outlet stores. There is about a dozen empty stores. That said, the attraction for us is still Greg Norman's Australian Grill. They still have the best steaks on the ICW in our opinion. It is also convenient to just take a stroll off the boat through the shopping area. The place still has dozens of stores and it's a interesting to just walk around. They have a lake that has turtles, large fish, Mallard ducks and swans. You are warned against alligators but we've never seen one here. Our night out at Greg Norman's was as good as ever. They have a clientele that's independent of the shopping area, they are always crowded, even during the week. If you go be sure to have a reservation and order a steak, their specialty. It's aged 28 days at least. 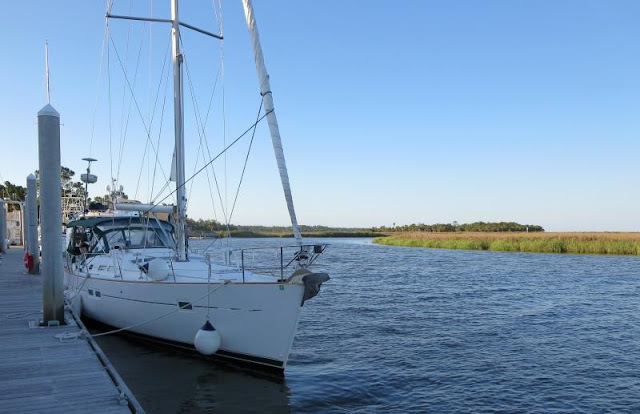 On Monday we're headed for St James Plantation Marina for one night before moving again north. We are on the homeward leg now so we'll be moving often. It was not a quiet night at Georgetown Landing Marina. We couldn't find a dock at our usual stop in town so we opt'ed for a marina farther north but exposed to a southerly wind. On cue, the wind came up all night and slapped the waves against the boat. 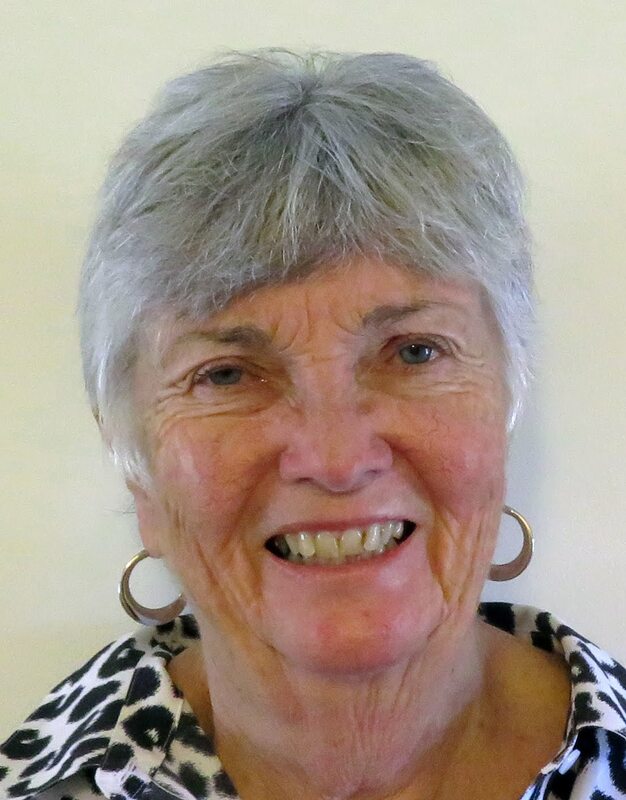 For me I just took my hearing aids out and I was fine but for Ann it was another matter. I don't think we'll be staying there again unless it's a guaranteed calm night. We went up the Waccamaw River today to wind up at Barefoot Landing Marina. It's a very beautiful trip up the river. There is very little development and the countryside is pretty. It must have been a blue moon since the tide was even in our favor, something that rarely happens. Unfortunately, the Socastee swing bridge is still in operation even though there's a 65 ft high bridge about 100 yards south! It even connects to the same road - but the locals seem to like their bridge and even had it declared a historical resource. Today they had some sort of celebration and people were walking back and forth on the bridge, we never did see any cars use it. So when we asked for it to open we were told they had to wait to clear the bridge of pedestrian traffic. That was bad enough but they also had an emergency event requiring an ambulance. All the while we're here doing circles and watching the cars that had to get from one side to the other using the 65 ft bridge! 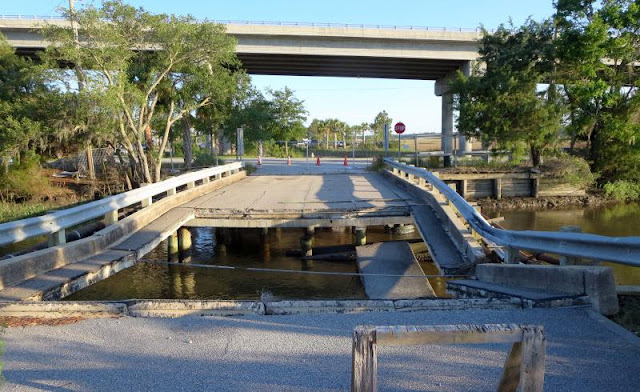 So it looks like us cruisers are stuck with this swing bridge that occasionally get inundated with flood waters and doesn't open for weeks at a time. There is no logic here, only emotion. It doesn't affect the locals since they can always get across using the 65 ft bridge about 100 yards south. Crazy. 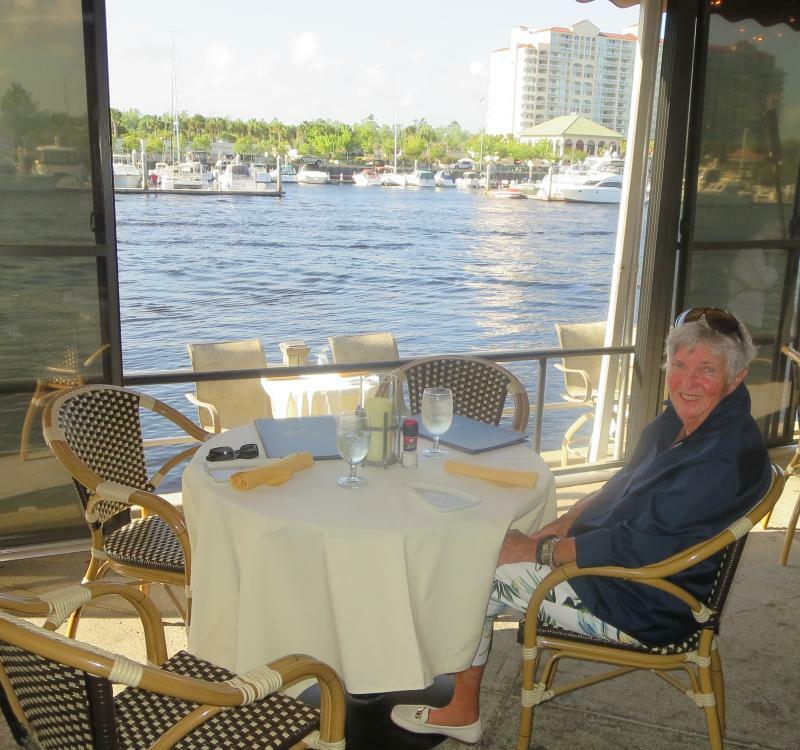 We plan on being at Barefoot Landing Marina for a couple of days and I owe Ann a dinner at Greg Norman's Australian Grill, her favorite restaurant on the ICW. 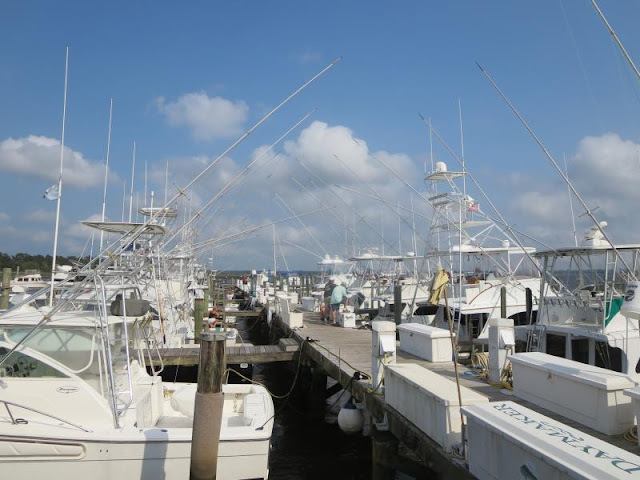 After that we'll look for weather and if it's good, we'll head out for St James Plantation Marina on Monday. If the thunderstorms develop as predicted, we'll wait another day before heading north again. We went through all the shallows of McClellanville at high tide. Boy, does that make things easier! Still, the least we saw was 5.1 MLW. 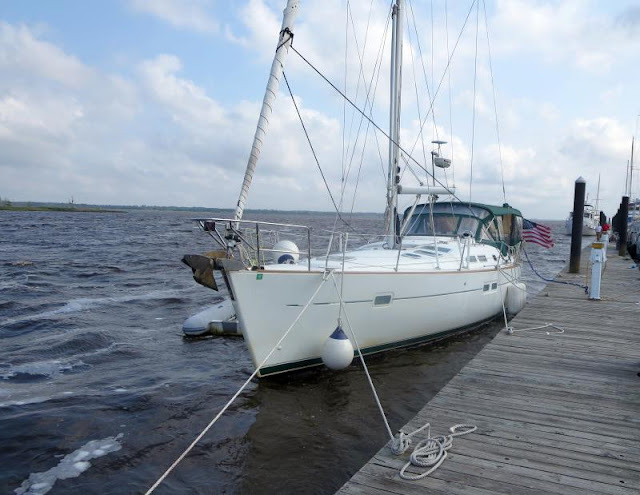 We could have made it through at low tide with our 4' 9" keel although not on a drain tide of -0.6 ft like yesterday afternoon which is why we decided to anchor out at Awendaw for the night. Normally we like to stay in town at the Dry Stack Marina which is more protected than this marina but they were full. One of the attractions of Georgetown is the fish market but from where we're at tonight, it's a long ways. This marina did have a loner bike which I took to get fresh fish. They had tuna! We've looked for fresh tuna all up and down the ICW and they had it here. Ann prepared it with a marinade and seared it 1.5 minutes per side, just enough to give a crust on the outside but not enough to spoil the inside by overcooking. We'll leave Saturday morning for Barefoot Landing for two days. It's provisioning time for the rest of the trip and they provide a free service for trips to Walmart and I've promised Ann a dinner at Greg Norman's Australian Grill, our favorite restaurant on the ICW. With the current behind us we find that it's easiest to just back out and continue that way until you reach the ICW. Backing and then going into forward for a quick turn with a 1 to 2 kt current in a limited space fairway is a formula for true excitement, for yourself and for those on adjacent boats! So we made the exit without incident, always a positive. Elliot Cut was supposed to have only a 1 kt current but we found 3 kts against us. It must have been due to the recent heavy rains. 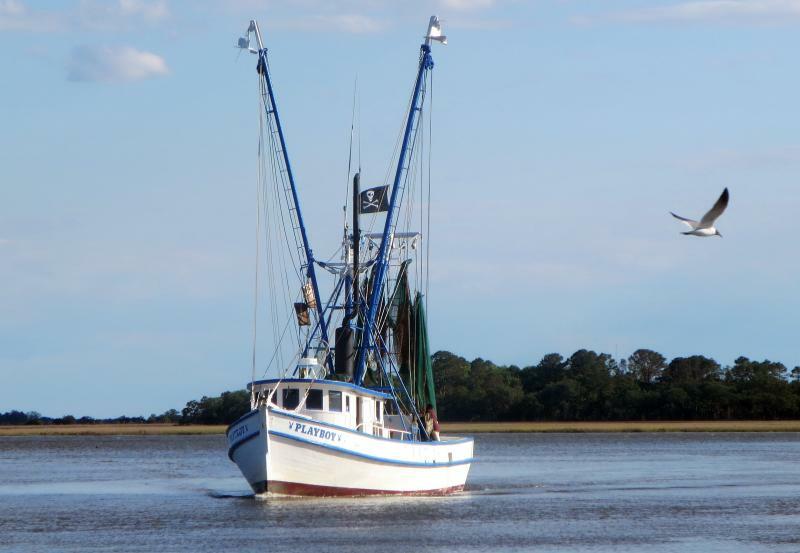 We proceeded across the bay and entered the Isle of Palms passage. It was just dredged last year but we found that it is already starting to shoal up to 5.1 MLW in one place. 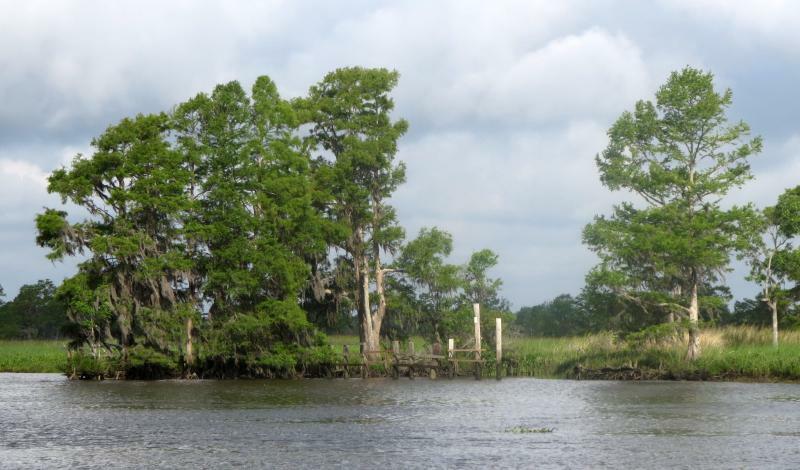 By the time we reached McClellanville, the tide was dropping so we took our planned anchorage at Awendaw. It's an easy in and out with 10 ft everywhere and no wave action. You could drop an anchor there and hold at 1:1 scope! The bottom is thick, gooey mud. Out in the boonies! A nice anchorage, plenty of room. We know the anchorage well from our previous visits and we have a place mapped out for Hoolie relief which we used twice so far today. We expect a quiet night and then we're off for Georgetown but with a high tide for all the shallows through McClellanville, no aspirin needed this trip! 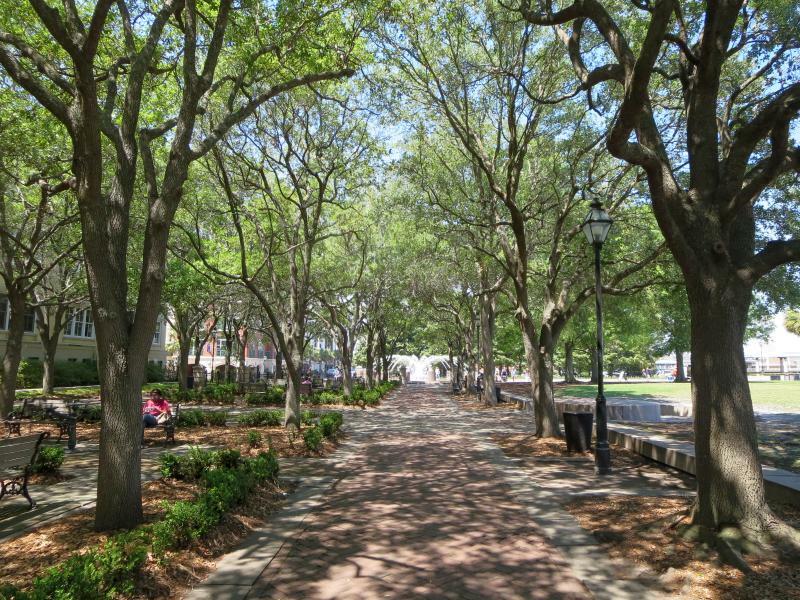 The great weather returned today with sunshine and temps in the high 70's. Ann missed her Harris Teeter "fix" on the way down due to hurricane Matthew so I rented a car today so we could spend most of the day in Charleston. Now, this place has a courtesy car but it's only available for two hours at a stretch. The first stop was at Harris Teeter which Ann loves and with that behind us we headed for downtown Charleston. 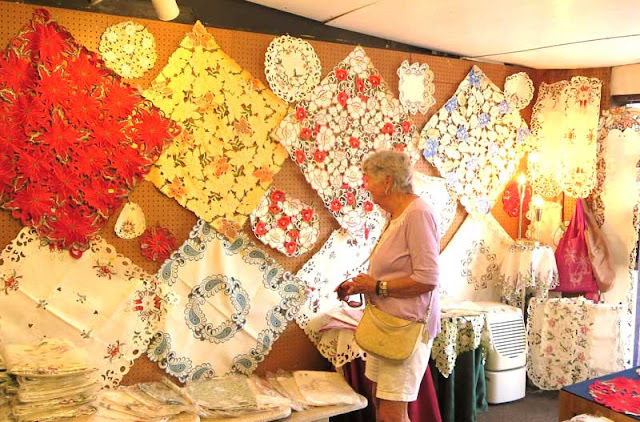 The first stop is always the shops at the Charleston City Market with over a hundred vendors with products mostly made in the area. 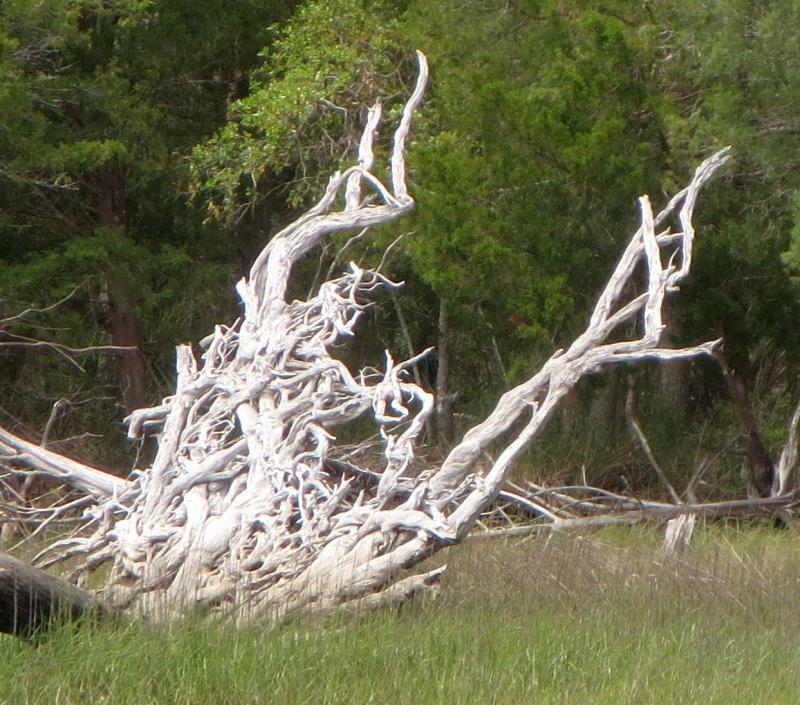 We roamed around there for almost two hours before heading out again for a walk along the eastern shore. Charleston has classic southern homes, mostly brick in this area. Their parks by the water are first rate. One in particular has multiple fountains directed towards the center and splashing and wading is encouraged. I imagine it's very popular in the summer heat. We will be leaving in the morning for Awendaw to anchor in preparation for McClellanville on Friday to wind up at Georgetown. We have the tide with us so it shouldn't be a problem. How would you like this boat upstream? As I was getting ready to leave from B and B Seafood, I happened to look at the boat behind me. 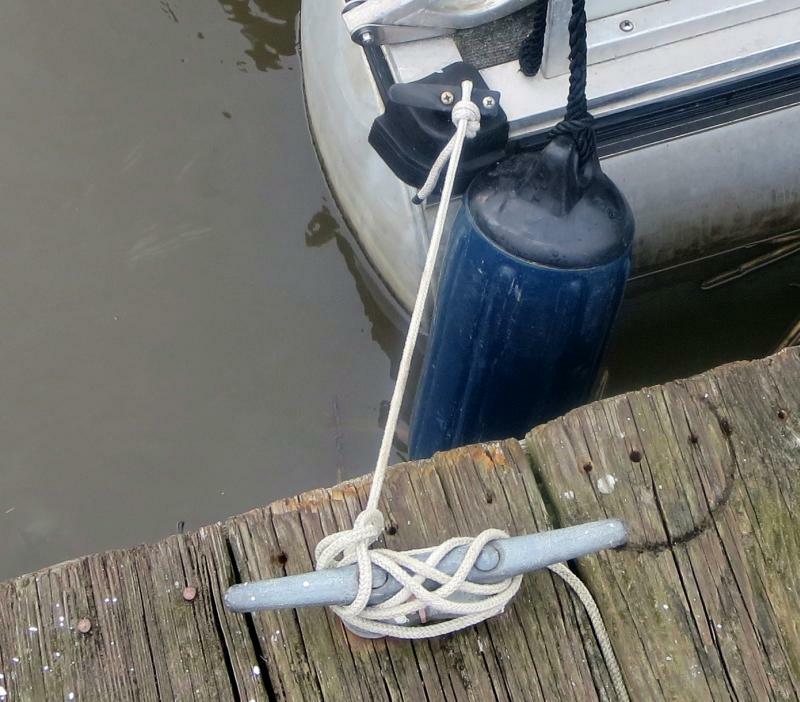 He was evidently a very frugal guy since he only used clothesline to tie off his boat. He had one piece on the aft section but the bow of the boat had a line that evidently was not long enough so he tied another clothesline to it with a knot. If I had known that's how that boat was tied off in 2 and 3 kts of current directed at my aft, I would have been nervous and would have donated line of a proper size to secure the boat. Fortunately, nothing amiss occurred. We had no problems through the shallow spots since we had plenty of tide with us. Even so, we could have made it through at low tide with our 4' 9" draft. I made entries into Active Captain with more details. St Johns Yacht Harbor is a top notch outfit. They even have a courtesy car. Docking was interesting in almost 3 kts of current due to yesterday's heavy rains. We heard that some places got 6 inches in the space of only several hours. We wanted a car for an all day adventure in Charleston since we missed our usual stop at the Maritime Center in the fall due to hurricane Matthew damage. 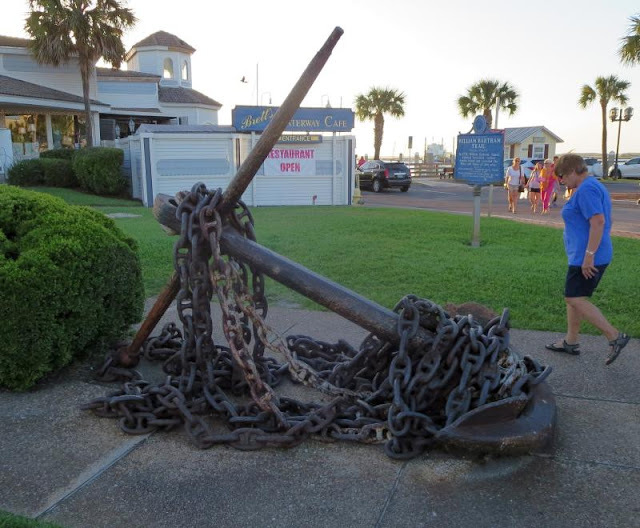 In fact, the Charleston Maritime Center is still closed! We walked by and apparently no work has been done yet to repair the damage. Several docks are askew and some are missing entirely. Needless to say, they are not open for business. 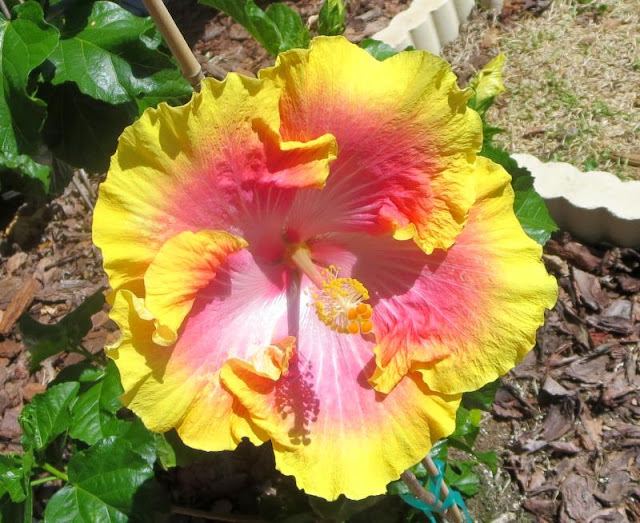 Wednesday is time to explore and visit Ann's favorite store, Harris Teeter. We'll move on Thursday morning and drop the hook at Awendaw. Thunderstorms were predicted all day long today but when we checked the weather in the morning, everything had changed. Now the morning was clear and the storms were projected for the afternoon. With that info, we set out around 8:00 for B&B Seafood. We had the tide with us in the morning so the shallow spots such as Ashpoo were not a problem. Not much to look at for they have great shrimp! When we arrived we couldn't raise anyone on the radio or the telephone and later we were told that they were closed today. We had made our reservations earlier in the week so we just pulled up and tied off on their dock, no problem. They open Tuesday at 8:00 and we'll see if they have shrimp available. 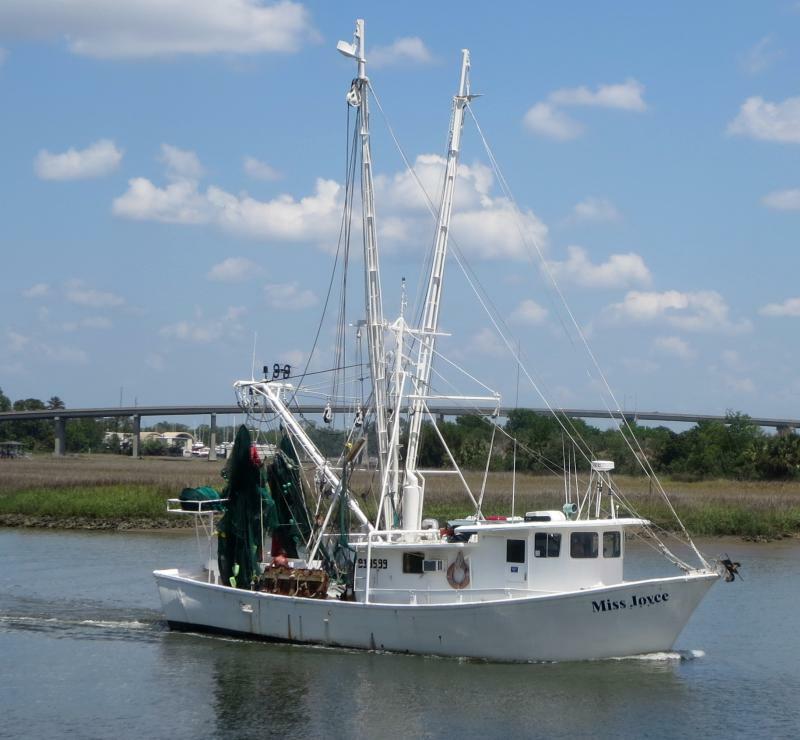 We saw one of their shrimp boats pull in front of us this afternoon so I would imagine there ought to be shrimp available in the morning. This place is not for everyone. It is not a marina, it's a seafood market with a dock. There's no electricity on the dock so you'll have to rough it but the cost is only $30/day regardless of length. The attraction is the fresh shrimp which they catch daily. 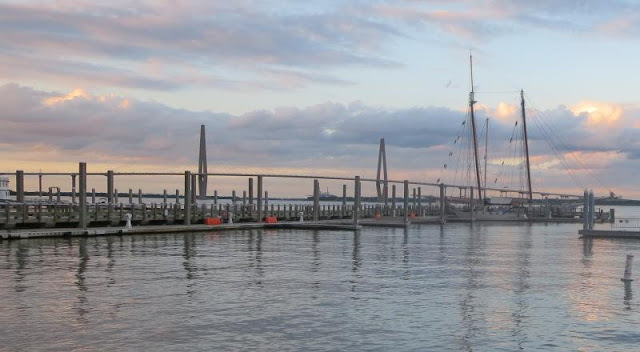 On Tuesday we're headed for the the St Johns Yacht Harbor marina and we have a car reserved from Enterprise for 4:00 pm which we'll use to explore Charleston and provision. 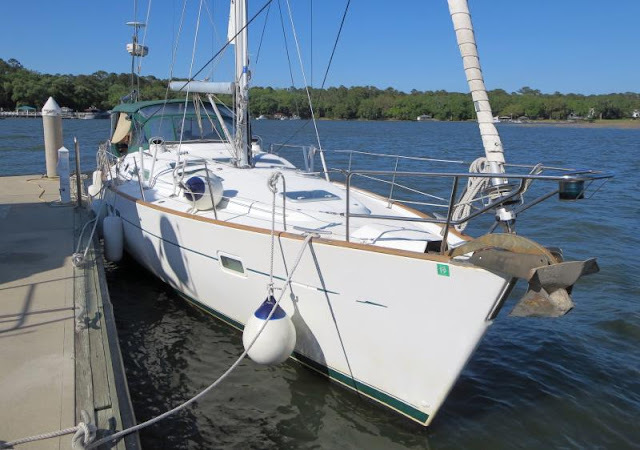 Then it's on to the Awendaw anchorage, Georgetown, Barefoot Landing and then St James Plantation Marina on 5/1/2017, at least that's the plan. 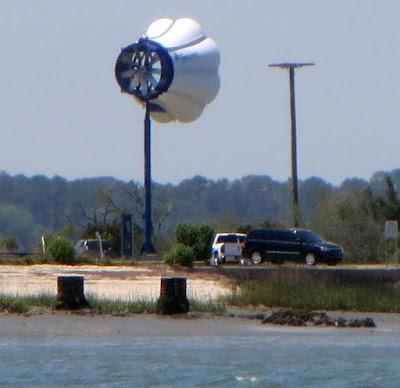 Can anyone identify what this thing is? With the thunderstorms delayed until later afternoon, we decided to push on to Beaufort, specifically Lady's Island Marina. During weekdays the bridge there has very restrictive hours and doesn't open at all between 7:00 and 9:00 am and from 4:00 to 6:00 pm. Otherwise it opens on the hour and 1/2 hour. However, on weekends it's on demand so we came up and asked for an opening and got one right away. The passage was fairly routine today except for the exit from Field's Cut. The Coast Guard added a red buoy at the exit to mark the edge of the shoal but the shoal has been growing. You have to give that red buoy at the northern exit a wide berth to avoid shallow water. I didn't and saw 4.5 MLW right by the buoy. The calm before the storms. All the marinas seemed to be more crowded than in the past. 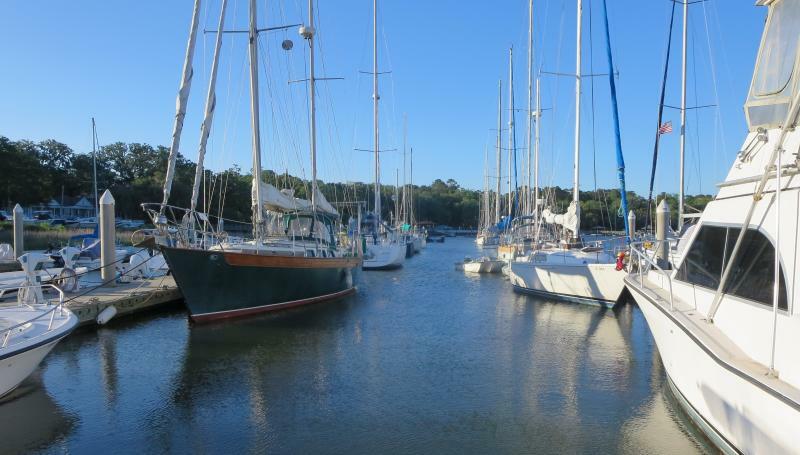 We called ahead to Beaufort marinas and couldn't find a slip which we wanted for the night since there were thunderstorms predicted. On the way north we got a call from Lady's Island Marina who had a cancellation which we took advantage of so we're here for the night. The front is due to come through around midnight and last at least until 8:00 am. 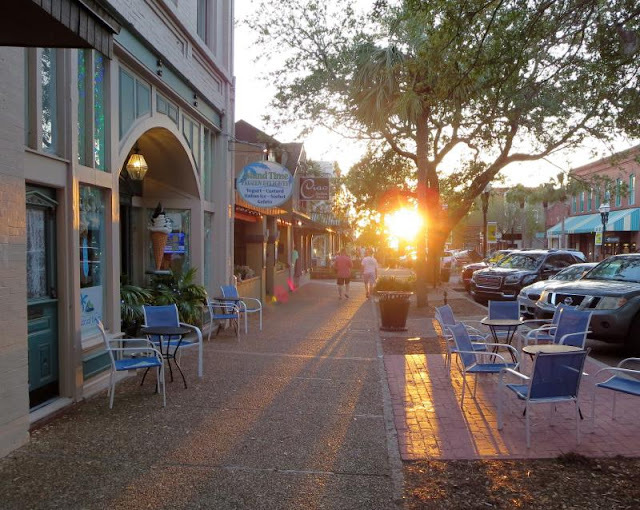 If we see a lull we'll head for B & B Seafood for Monday night and on to Charleston the next day. If not, we'll sit out the storms here. The trick is not to be on a fixed schedule, let the weather guide you, don't go regardless. Who wants to be out 8 hours in a driving rain or lightening? We left late morning for Thunderbolt Marina. It's one of our usual stops along the ICW. They have good washers and dryers plus they deliver Krispy Kreme donuts to your boat every morning. What's not to like about that! Typically in the reviews for the marina you'll see pros and cons with the morning delivery of donuts in both the pro and con column! Pro, because they are really good and con because they are really fattening with lots of calories. 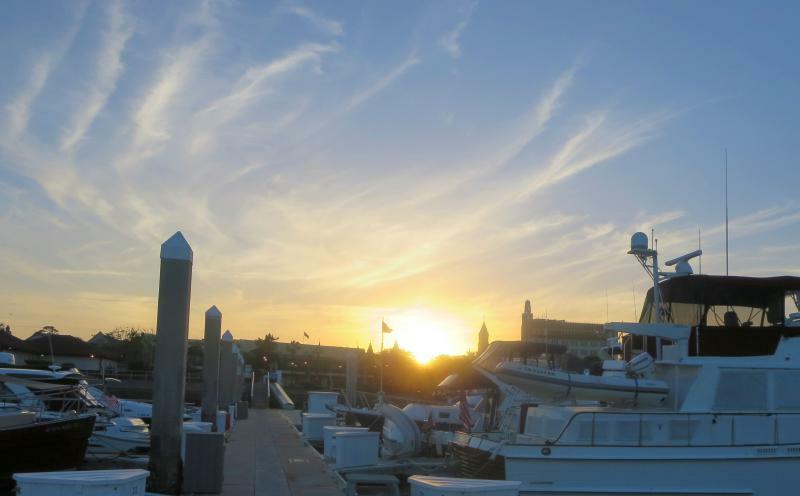 Nevertheless, we like the marina. 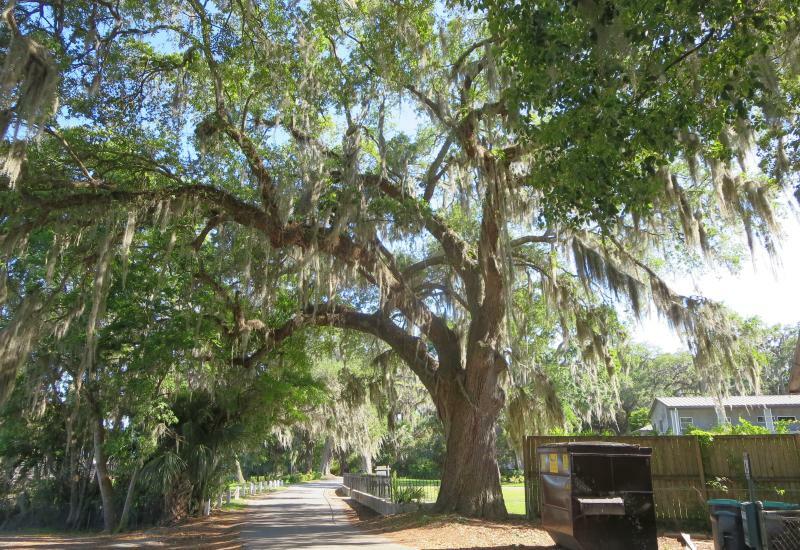 It doesn't have the high concentration of no-see ums that you have at Isle of Hope which is right next door to the marshes. It's also $0.25/ft cheaper too. As we sat on the back of our boat we saw a huge progression of dredges pass by. One was carrying the equipment for dredging and one the piping to deposit the dredge material some distance away from the dredging fleet. I've never seen such a huge progression of dredgers and pipes. In addition to the tug pulling the assembly, there were two other smaller tugs along side to guide the barges around turns. I can't imagine they could turn very sharply and we were really wondering where they were headed. It's too much to hope that they would deepen Hell Gate. They usually concentrate on major shipping lanes and pay little attention to the needs of the ICW, at least in Georgia. I hope I'm wrong. We got our laundry done as we intended and we may not leave for two more days due to thunderstorms predicted for Sunday and Monday. We'll see how it goes and leave when the forecast is good. Normally on a leg from Fernandina to Savannah we would anchor out at Jekyll Island, then anchor out at Wahoo River and then on to Savannah. However, the tides were not right for that sequence. We would have wound up going through some of the shallowest places at dead low tide, not fun. 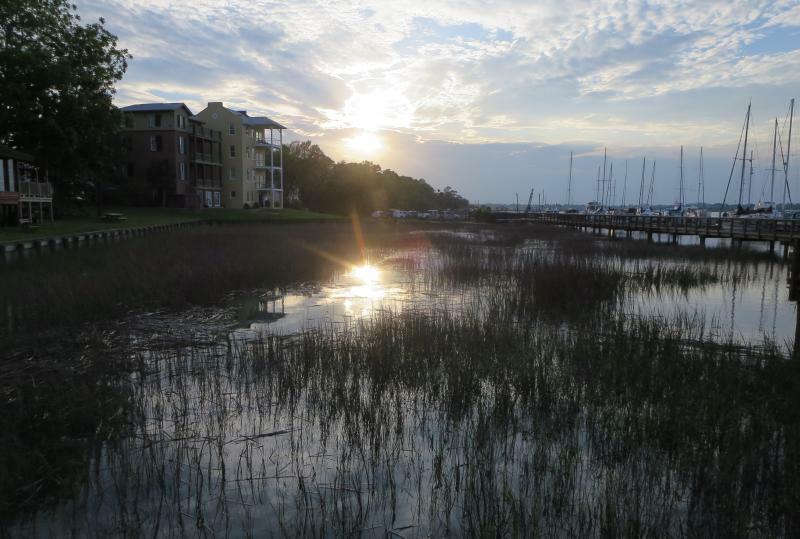 So from Fernandina we pushed on to Hidden Harbor YC which is north of Jekyll Island. 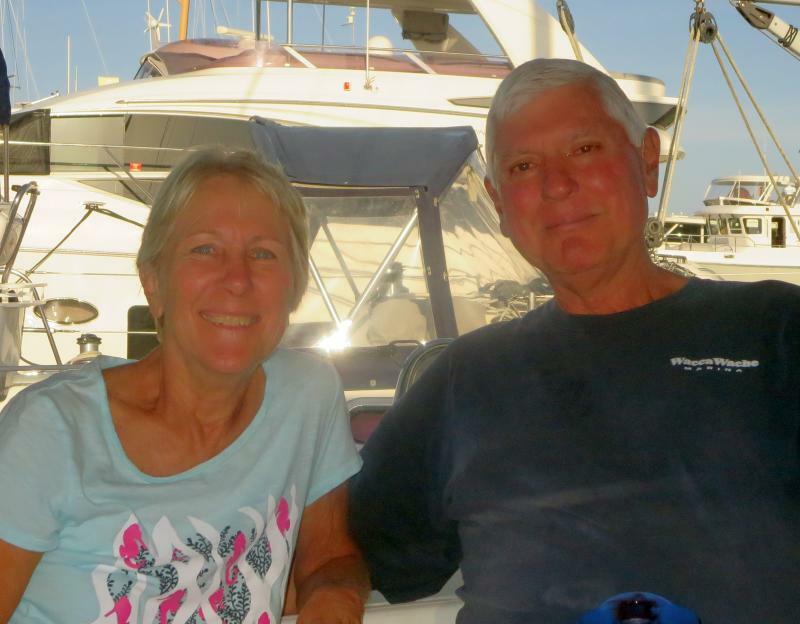 We stayed there for one night and then left at 6:45 am intending to reach Wahoo River but then decided to travel on to Kilkenny Marina but then changed plans once again since the weather was so nice and the tides were right. That's how we wound up at Isle of Hope in Savannah, it's on the other side of Hell Gate where the minimum water is 4.2 ft MLW. We came through with a 5 ft tide and all was fine. I really wonder how they manage to get in and out, the fairways are tight! We're on an outside dock. So we are here for the night before moving on to Thunderbolt on Saturday and Sunday. Depending upon the prediction for thunderstorms, we'll stay one day, two days, or three days. We're in no particular rush to get north, it all depends on the weather and being comfortable while on the water. That's one of the big advantages of being retired, you can set your own pace. Isle of Hope Marina here is full. We only got a slip because of a cancellation but we have two days reserved at Thunderbolt on Saturday and Sunday. They didn't seem to have suffered much from hurricane Matthew. Their docks here are massive and I guess that helped. We'll leave in the morning for Thunderbolt Marina. Fernandina is one of the towns we just enjoy walking through. There are lots of shops and the atmosphere is pleasant. The marina is still a mess. We heard that they are waiting for federal funds to rebuild the docks. Lots of luck on that. Meanwhile, they do have a dinghy dock that's actually better than the one before the storm. It's more convenient and bigger (since there are very few boats, they have the room). The main attraction today a for a visit to Magna's, a local legend for hair beautification. Magna's is one of our must do stops along the ICW so Ann can get her hair styled. A word of warning though, you must make reservations in advance, especially if there's a particular hair stylist you want. It's a very popular salon. We went to Pepper's for a Mexican dinner with Jane and Al. We enjoy the outdoor setting and the food is good. To top everything off, I finally got all the kinks out of the regulator. 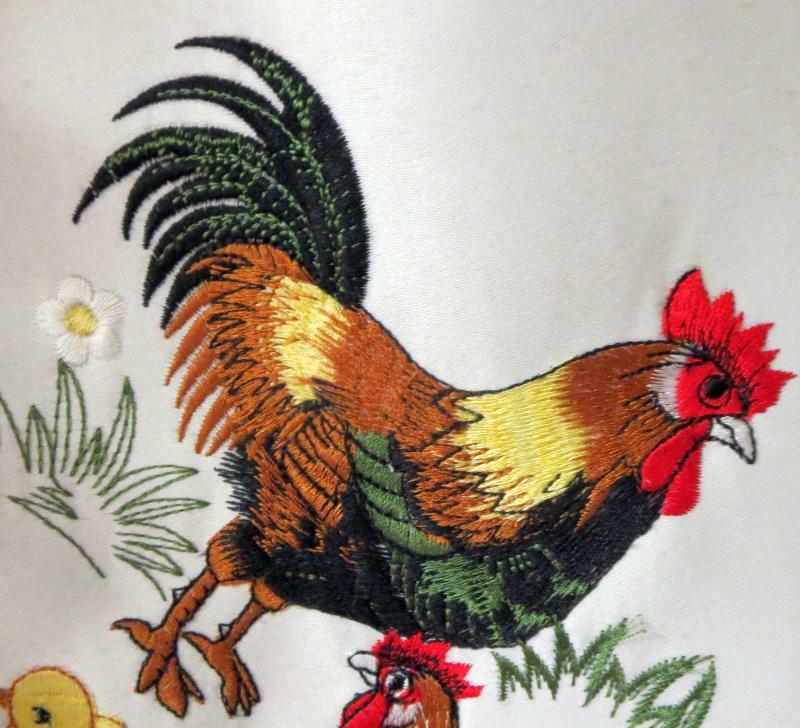 I'll put a file on the blog site on everything I found out about regulators. They are remarkably complicated. At least the one I have from Balmar is fully adjustable if you carefully follow directions. 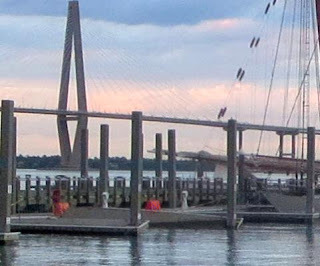 Thursday we'll head for the Jekyll Island anchorage just south of the bridge unless we decide to push on. 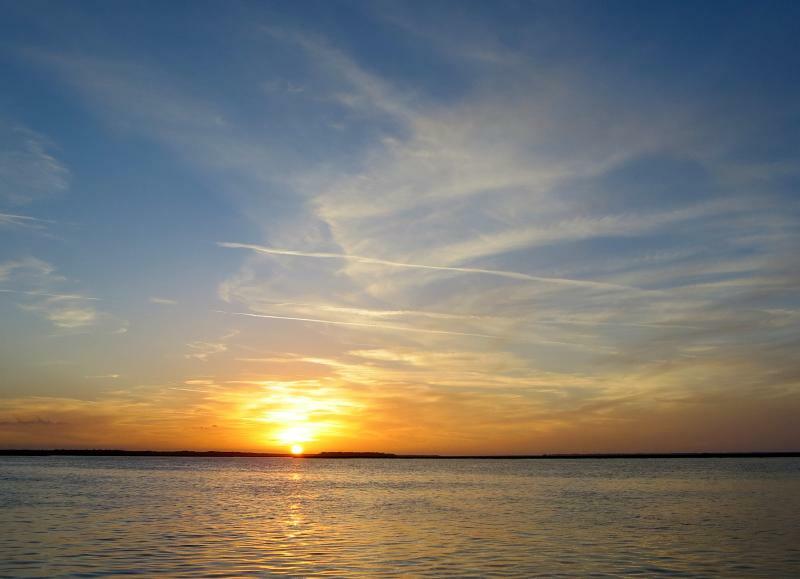 The weather always rules on the ICW. We left St Augustine this morning with the intention of stopping over at the Jacksonville free dock for the evening. However, as the day progressed the weather turned out to be even better than forecast with temps in the upper 70's and little wind and full sun. Our ETA for Fernandina hovered around 4:15 pm and so with that we decided to just push on. You just don't let a good weather day go to waste when on the ICW. None of the traditional shallow spots held much of a challenge and Fernandina is no longer a problem given the red side waypoints published on my blog site under ICW Tips, be sure to use those waypoints if you come through Fernandina. It's hard to eyeball the passage so the best technique is to just input the five waypoints into your chartplotter and enjoy a worry free passage with at least 9 MLW, mostly more. There are still shoals to 3 ft waiting to ambush those who don't follow the foolproof waypoints. Fernandina is still not fully open for business. 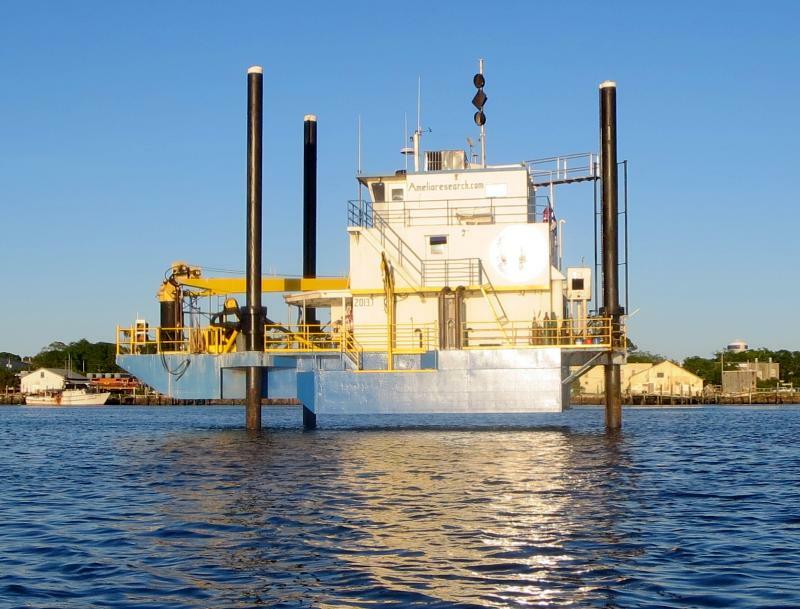 The facedock is not operational and the dock office is non-functional as well as the gas dock. However, they do have a dinghy dock which we took advantage of for Hoolie. We'll go exploring Wednesday and Ann has an appointment at Magna's to get her hair done at 4:00. Afterwards we'll go the Peppers for dinner, one of our favorite Mexican restaurants along the ICW. Ann is an artist and she loves to talk shop. 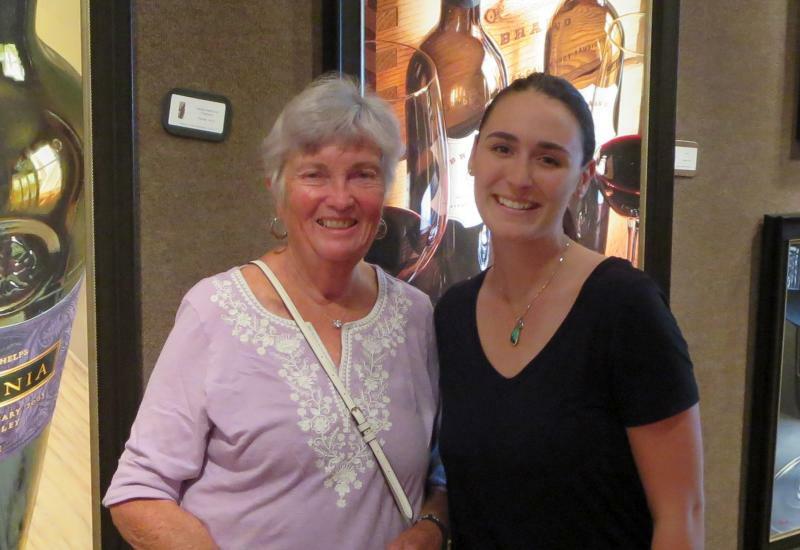 The place to do that in St Augustine is in the art galleries. With any luck she'll see a visiting artist giving a demonstration like we did in Key West. Even if no artist is painting, she loves to talk to the gallery curator. So today we made two walks along the streets of St Augustine stopping in a half dozen galleries. Roughly half of the artist's works on display were from artists we had seen before, mostly in Key West. They tend to spread their work among several galleries. The paintings were first rate and interesting to see how they displayed their subject matter. The best artists have developed a style. Some paint the same subjects over and over but do it extremely well. 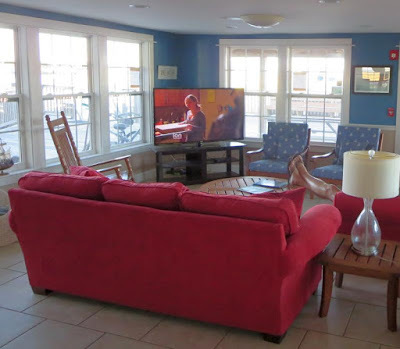 For example, Thomas Arvid specializes in painting wine and wine glasses and we've seen his work all up and down the ICW. Ann met him in Key West. He's a technical wonder at what he does with oils but I have no desire to hang one of his paintings in my living room. Other painters have other styles and Ann enjoys exploring all of them and talking to the curators of the galleries. 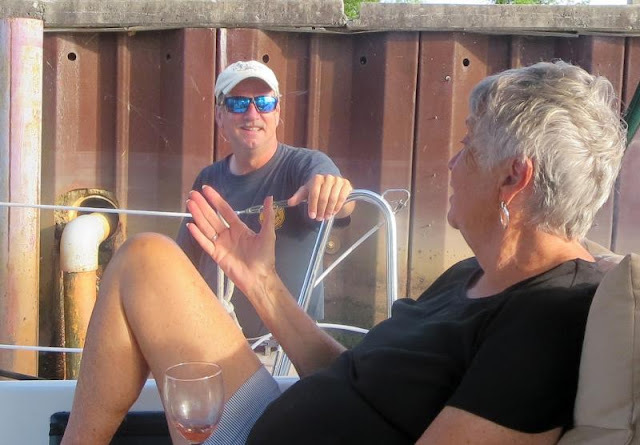 After a day of strolling St Augustine in beautiful 70 degree weather, we were invited over to Al and Jane's boat for wine and I got a chance to talk shop. It was a great time had by all and we retired to Fleetwing for dinner afterwards. 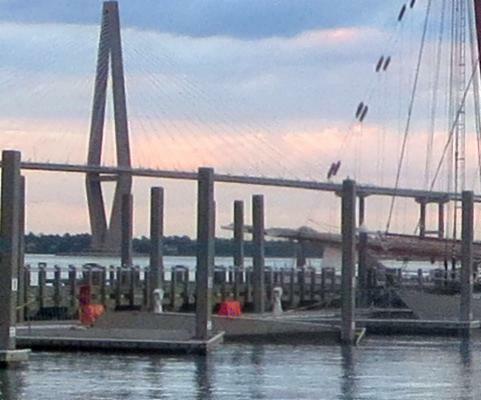 We're headed for the free dock at Jacksonville Tuesday afternoon and hopefully it won't be full. We'll have some shallow spots to entertain us along the way but nothing too bad. It's less than 40 Nm so it will be a relatively short day. Heading north from Daytona, our first real obstacle was the shallows of Ft Matanzas. For the past four years it has gotten shallower and shallower. 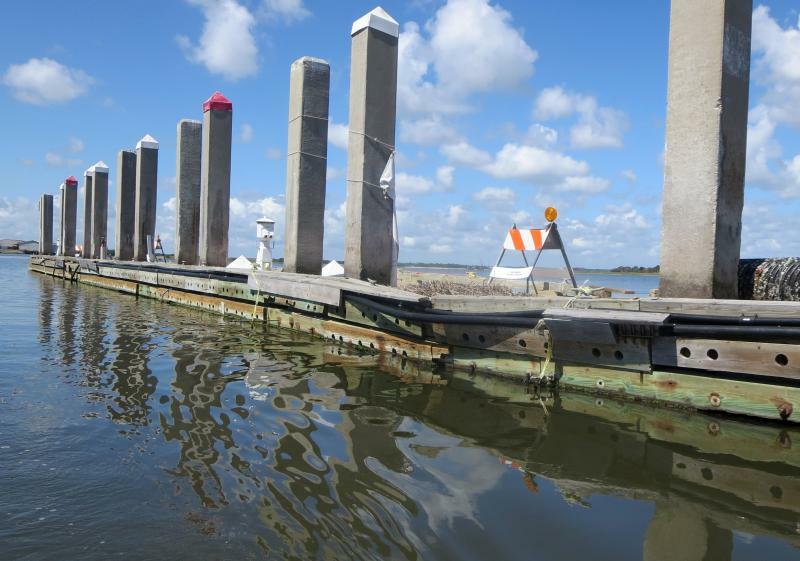 The Army Corps of Engineers (ACOE) has responded by installing lots of buoys and moving the passage within a few feet of land on the western shore where there was still deep water. This year they finally decided to dredge the entire area. In coming upon the area from the south, we noticed that two of the four green buoys were missing. Ann went forward with binoculars to look for the familiar four green buoys but could only find two. As it turned out, two of the four were no longer needed. 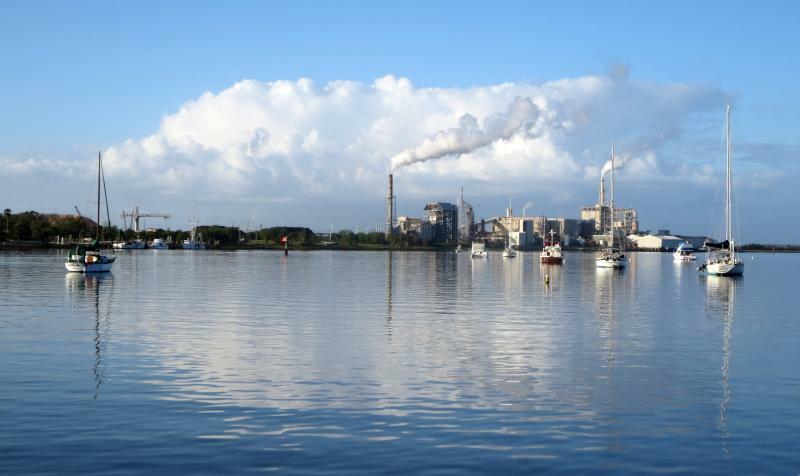 The ACOE had the area dredged so widely that there was 12 MLW everywhere! What a difference dredging makes! The dreaded passage was a piece of cake. 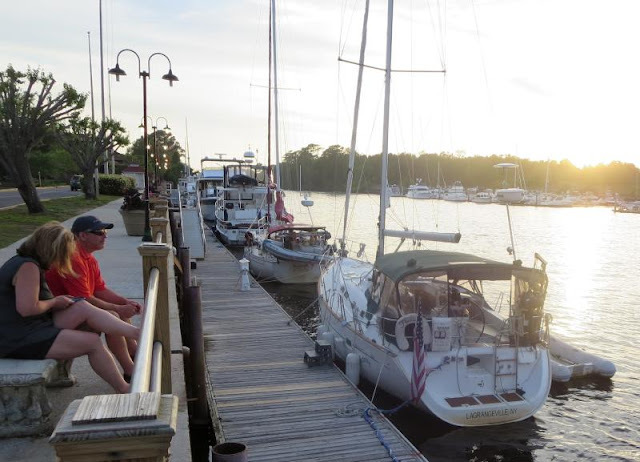 We stopped by Palm Coast marina for fuel which is a great place to fill up. The prices are good and the dockhands are very helpful in tying up. 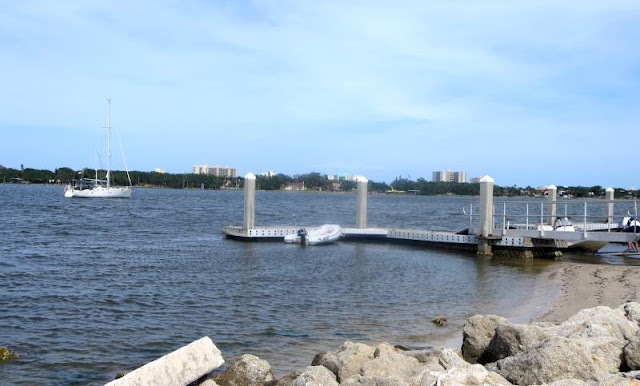 We wound up at St Augustine marina at a dock which is no piece of cake in itself. The current runs up to 2 kts so you have to be careful on what you do coming in but we made it with no hits. 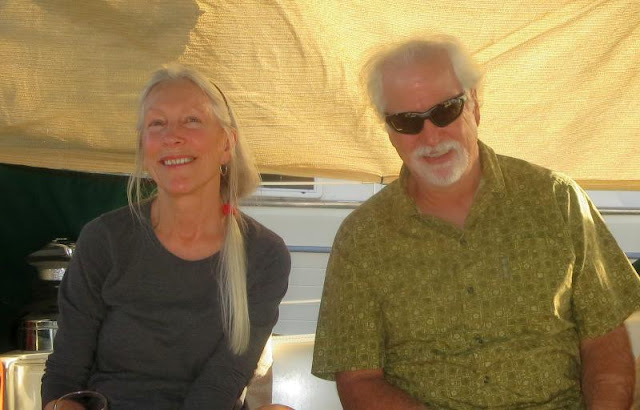 We met one couple that has followed Bob423 posts on Active Captain in their ICW travels and they came over to talk and trade stories. We enjoy such visits and those in the area are always invited to stop by. We'll be here for another day before leaving on Tuesday for Jacksonville. Ann wants to walk along the shops and look in the art galleries and I've got to call Balmar about my charging problem. It looks like the regulator is simply overheating and turning itself off, we'll see. We went through two shallow spots today. The first one was by the southern part of Ponce de Leon inlet where it meets the ICW. The ICW continues to fill in by R18 and today we saw 5.1 MLW, about two feet shallower than in the fall. The second spot was by R2 farther north which came in at 5.5 MLW. In both cases we hugged the reds by 20 to 30 ft. But I can't complain, Florida has done outstanding job in dredging this year at Ft Mantanzas and opposite Ft Pierce in the ICW. Given their past performance, I'm sure they will clean up these two annoyances too. We got an early start from Titusville since we wanted to leave before the high winds whipped up. Getting out of a tight slip is easier with little wind. 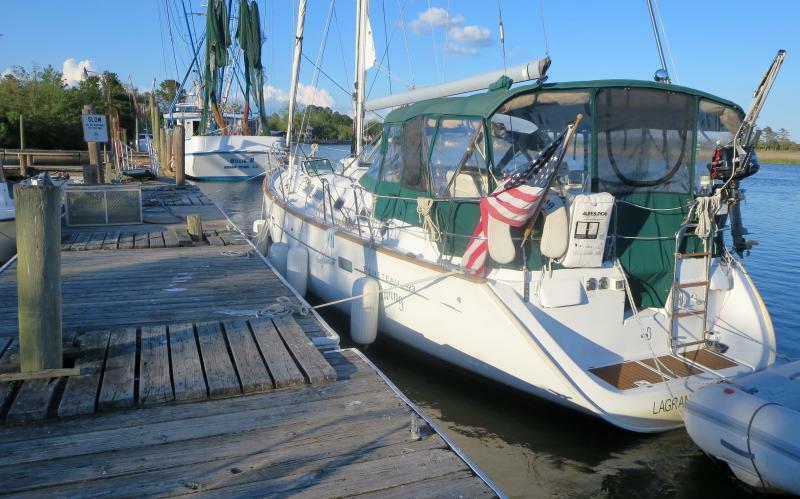 The bottom scrubbing we had done at Titusville restored our 7.3 kts of cruising speed. However, all was not wonderful. The charger started up fine but then it quit after about 1/2 hour! I unplugged it and restarted the charger whereupon it worked for another 1/2 hour but then quit again. I don't know what's going on here. I wrote a long note to Balmer technical support on the problem but, of course, it's the weekend so nobody was home. I'll follow up with a call on Monday. It's a little windy here but still okay. The holding is good so there's no concern on that. 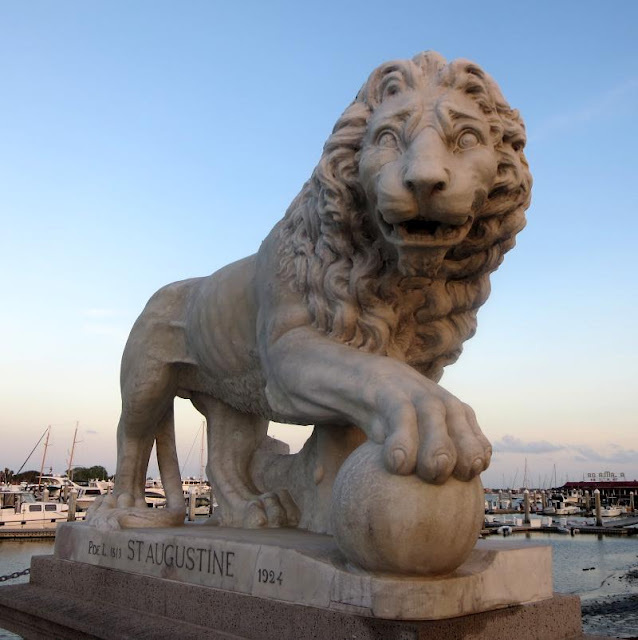 We plan on arriving at St Augustine Sunday for a two day stay. Ann wants to walk through the shops and just see the area again. On Monday I'll call Balmer. The regulator finally arrived today! It was an exact replacement for the old one as far as mounting holes and length of cabling was concerned. 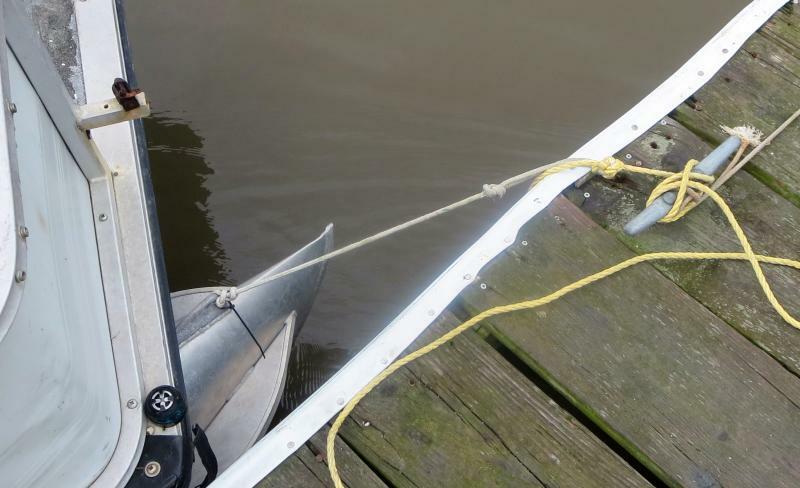 With that it was relatively simple to install, even for a sailboat. I ran an initial test and it seemed to work fine bu the real test will be while cruising north on Saturday. We had Jan and Derek over for our Easter Dinner which we had today instead of Sunday when we'll be traveling. I baked a southern ham (400F for two hours) and they brought over wine and dessert. A good time was had by all. 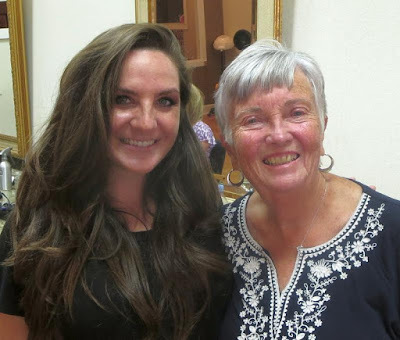 As I've said in the past, one of the best things about cruising is the people you meet along the way. 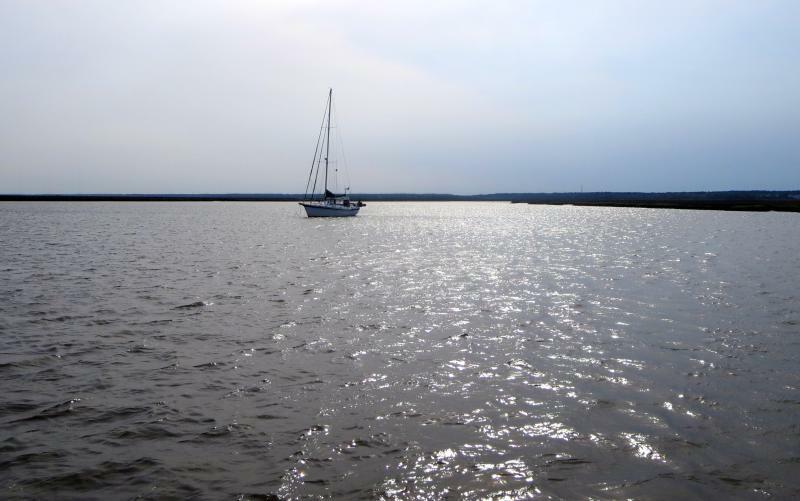 We will be leaving Titusville Saturday and are aiming for the Bethune Point anchorage. 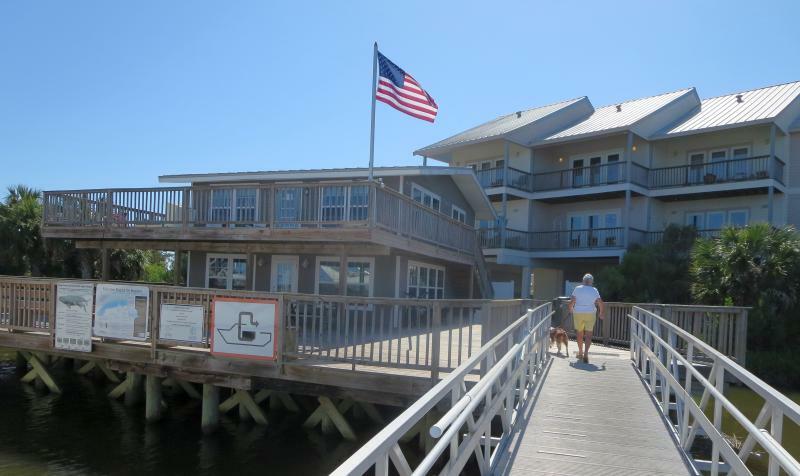 It's plenty big so we won't feel crowded and it has a public boat dock for Hoolie relief, that's about all we need. There are several shallow spots along the way so we'll be reporting on them in our next blog. On Saturday we embark on a part of the trip without easy access to supermarkets. So in view of that we did our last provisioning today and the freezer and refrigerator are both jammed packed. We also visited Harvey's for our last supply of Florida grapefruit. It's the best of the local places for fresh grapefruit and oranges. 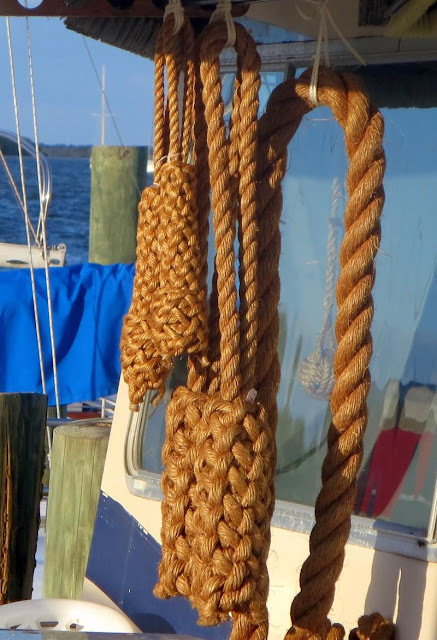 On the way off our dock, there's a guy who does fancy rope work and he had some of his work on display (see photo). It looks like he works in hemp, the traditional rope material. 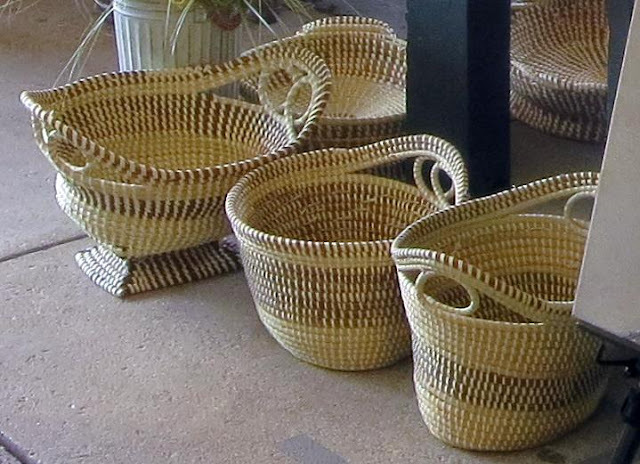 The hemp gives the knots a wonderful, golden appearance but it will degrade with time, unlike nylon. We're having friends over Friday for an Easter dinner with a ham. 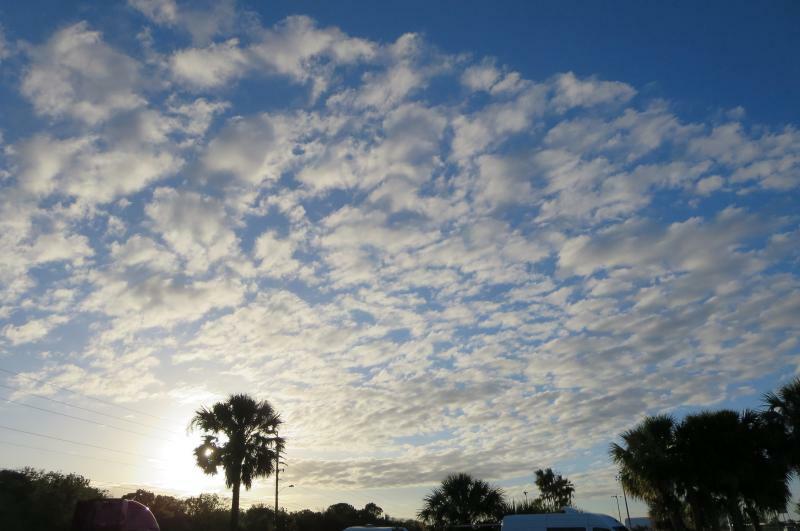 It will be our last hurrah in Titusville until next year. I still have to install the new regulator but it hasn't arrived yet. The last we heard via tracking was that it arrived in Orlando at 6:00 am this morning, only 42 miles away but it didn't make it here yet. I really shouldn't be using USPS but they promised (!) 2 day delivery.